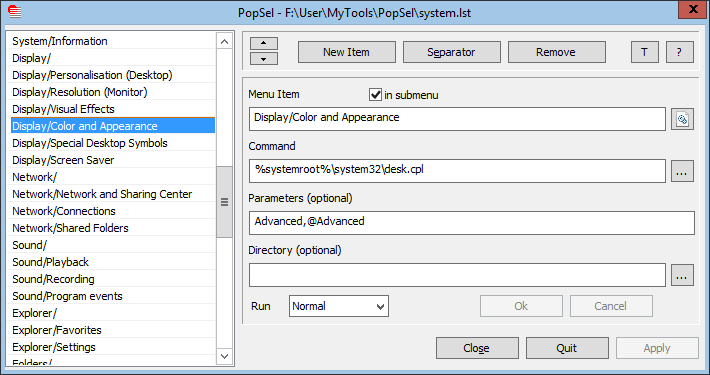 With PopSel you can reduce the number of icons on your Desktop, or make extensions to the Quick Launch Tray. You can offer a selection of program calls with different parameters etc.. PopSel can also be integrated into other programs, if they support launching an "external program". Any number of menus can be created through configuration files that are specified as PopSel command parameter (in shortcuts). Submenus (one level) are supported. Auto adopting drive letter on external devices (flash drives etc.). Special feature: Files can be listed in a submenu by search pattern, and launched with default or specified application. 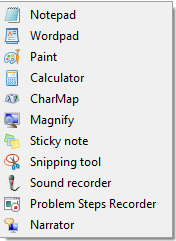 Configuration: When the menu is aborted (click outside the menu or ESC), the "Configuration" button will pop up. Alternative methods to enter the configuration: through an extra menu item, or by command option. Drag&drop files, folders or shortcuts. Shortcuts are resolved with parameters (if any) and directory. The command can be any executable file, document or web link. Relative paths and environment variables are supported. Special support for Explorer windows with pre-selected folder. Demo menu supplied, ready to run (see images).